This is a direct election effect, writ large. Under the Trump administration, the patent wrangler won't need to worry about intellectual property reform. 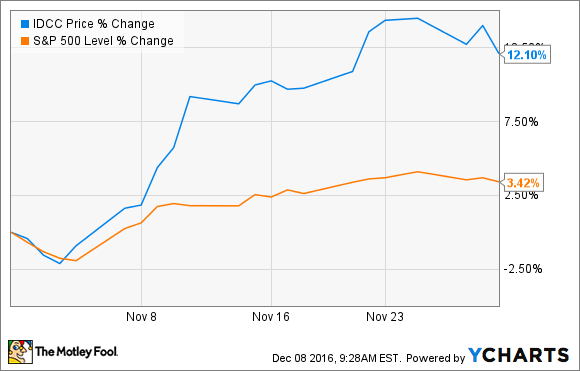 Shares of InterDigital (NASDAQ:IDCC) rose 12.1% in November 2016, according to data from S&P Global Market Intelligence. The company and its investors can thank Donald Trump for this boost. Heading into the 2016 presidential election, Hillary Clinton's campaign promised "targeted rule changes" in the convoluted and oft-abused patent system. She wanted to reduce the amount of frivolous patent infringement lawsuits, shifting the odds of victory in patent disputes a bit further away from the plaintiff. This could have been bad news for companies like InterDigital, whose business model relies on an active and aggressive presence in patent courts. Trump, on the other hand, has not outlined any specific patent policies at all and seems content with the current framework. "No one knows where the Trump campaign is," said former USPTO director Q. Todd Dickinson just before the election. "I knew who was advising the Romney campaign. There's just nobody working on these issues for Trump." So, it'll probably be business as usual in the patent sphere, which is exactly what InterDigital investors were hoping for. InterDigital shares started rising as soon as the ballots were in, and the momentum has not really stopped yet. Apart from a brief pause at the end of November, when the company published modest revenue guidance for the fourth quarter, this stock is on a roll. The 11% drop in October feels like old news now, and InterDigital investors have enjoyed a market-crushing 69% return in 2016.